12/26/2004 - The Ice is on! First ice is now and the fish are active. I fished on the chain tonight and found a solid 10"-12" of ice everywhere! Very cold temps last week have put a lot of ice on the lakes in a short time. Snowmobiles and ATV's will be no problem from here on out. 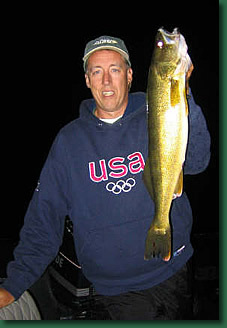 Walleyes active right at dark!